In today’s world of crowded school calendars, mandatory testing, School District policies regarding eligibility for extracurricular activities, as well as economic pressure affecting individual students’ ability to participate, a recent student travel trend is a trip which does not include a performance. Cost The most important benefit is cost. With airlines now charging for checked baggage it is very costly to take band equiment and/or uniforms on a trip. 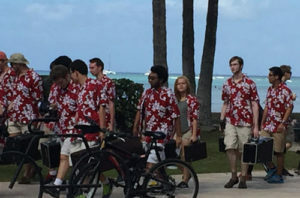 Baggage fees add $5,000 to $10,000 (or more) to the total cost of a typical band trip. More Dates The dates you can travel are greatly expanded. Instead of being forced to go when a specific event takes place, you can pick a date that works for your school and your group. With most school calendars jam-packed with events, test dates, etc., more dates can be very helpful. Eligibility A trip scheduled without the school calendar as the main driver can overcome many problems associated with eligibility and District policy concerning student absences, make-up work, etc. New Experiences Another welcome benefit is simply the experience of doing something new. The students have performed many times, but they may have never been to a Theatre Production or to a Symphony Concert. The educational value is intact, and the experience of traveling with peers remains. It is still an educational experience, which is why many Districts are approving this type of travel.